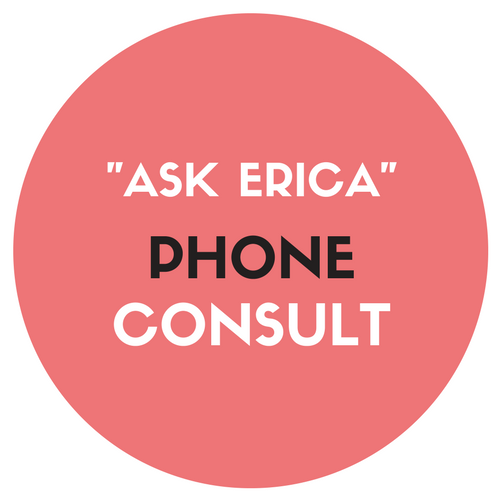 "Ask Erica" is a 20-minute complimentary Phone consultation to run any questions by me that you might have about my coaching services and working together. Anyone who wants to find out more about my Coaching programs, or other professional Consulting services. Book your session by clicking the button below, and you'll be connected to my scheduling system. Find a time that I'm available, and book your call! To book your NO OBLIGATION INTRODUCTORY CALL, simply CLICK the button below, and you'll be guided to my scheduling system, where you'll be asked basic information about your questions for me, as well as your contact information for our call.